A set of four coastal swimming pools – a bathing place and three tidal pools: Horseshoe, Ladies’, Gent’s and Children’s Pools. As their names suggest, the pools have a purposeful history reflecting the Victorians’ high regard for seawater bathing and even higher regard for propriety. 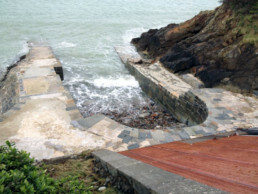 They form a unique complex along a promenade built under the cliffs of Havelet Bay and the ingenuity of the engineering and the beauty of the stonework is remarkable. The Horseshoe Pool, a purpose built ‘U’ shaped bathing place, the Ladies’ and Children’s pool are all in use. It is expected the Gent’s pool will be repaired and re-opened by January 2018. 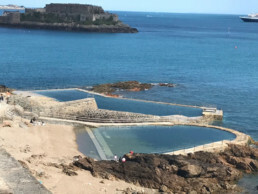 Submerged at high tide and flushed twice a day, the pools feature remarkable Victorian marine engineering and are a safe place to swim on a falling tide. The pools were badly damaged by storms in 2014, but prompted local efforts to raise funds for their full reinstatement and improvement. 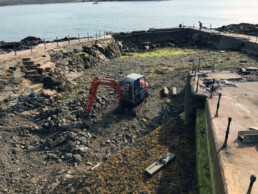 Future plans include taking on the proper maintenance of the Ladies’ and Children’s pools along with the kiosk, changing rooms and toilets. 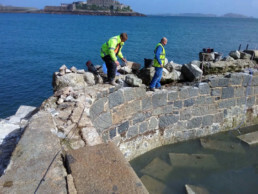 The La Vallette Legacy Project is in positive discussions with The States of Guernsey about future responsibility for and maintenance of the area and all the pools.